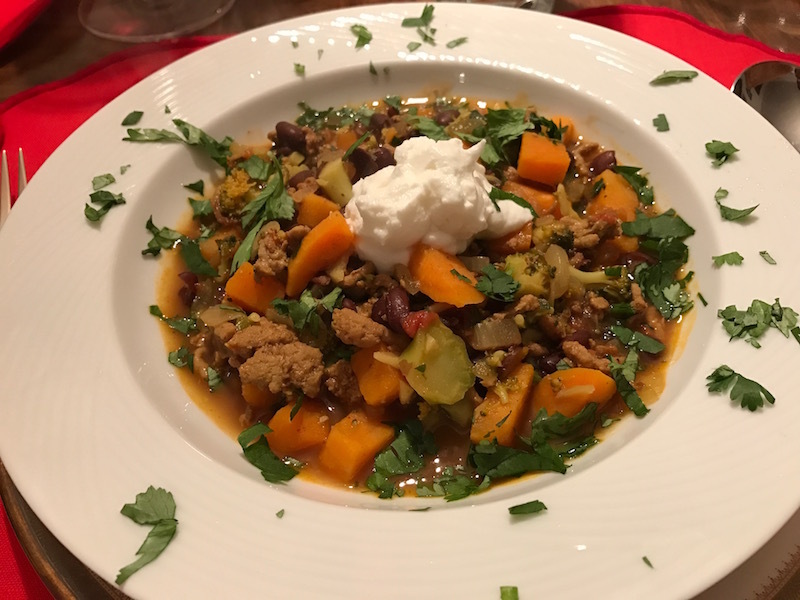 Stay Warm All Winter With My Turkey, Sweet Potato, and Black Bean Stew | Keep It Up, David! 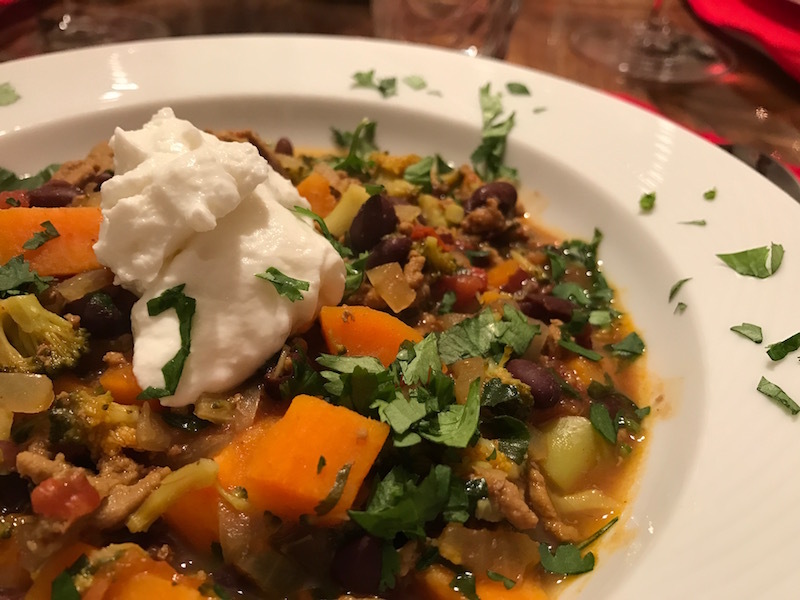 Here’s an easy, healthy, outrageously delicious recipe that that’s perfect for a chilly evening this winter. Make a big batch, and freeze the leftovers for an even simpler meal down the road! Doesn’t it look great? Heat up 3 tablespoons olive oil in a big, deep pot. Use the medium setting on your stove. When the oil is hot, add 1 onion, diced, and 5 cloves garlic, minced. You just want to sweat the onion a little bit, so it starts to soften. After a couple minutes, add 1 pound ground turkey. I used 93% lean turkey. Move it around so the turkey gets brown. It’s not important that the turkey cooks all the way through, there will be plenty of time for that! You just want to add some sear and color right now. 1 can diced tomatoes. Add the entire contents, no need to drain. Bring it to a boil, then reduce it to a simmer and let it cook about 20 minutes. And that’s it! You’ll know it’s done with the sweet potato is cooked through and tender. Ta-da! A one-pot meal that everyone will love. Right before serving, I stirred in a couple tablespoons fresh chopped cilantro, and reserved a few more tablespoons for garnish. And that’s a dollop of nonfat, plain Greek yogurt in the center, instead of sour cream. You won’t be able to tell the difference, and the yogurt has about 1/3 the calories that reduced fat sour cream has. This recipe is easily adaptable. Leave out the turkey and make it vegetarian. 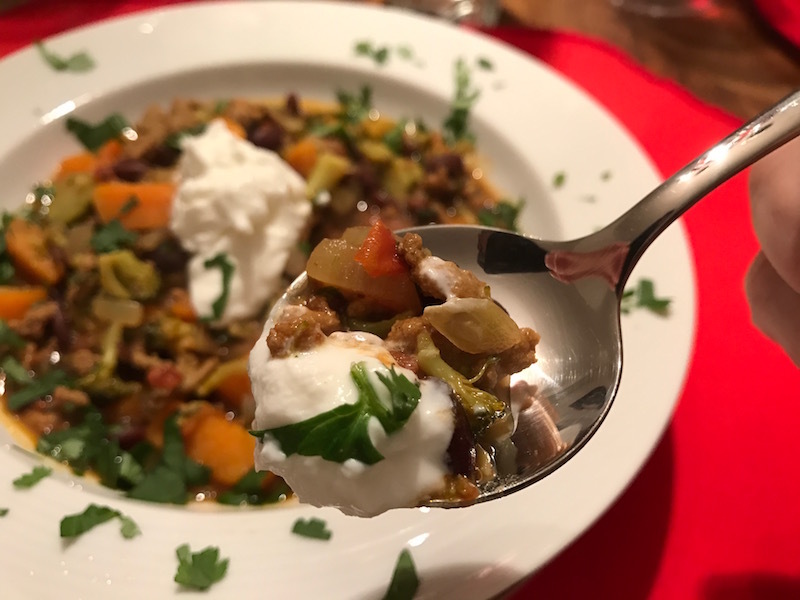 Leave out the turkey and yogurt and make it vegan! Have other veggies lying around? Swap the broccoli for cauliflower, green beans, or zucchini, or don’t swap, and just add more veggies! 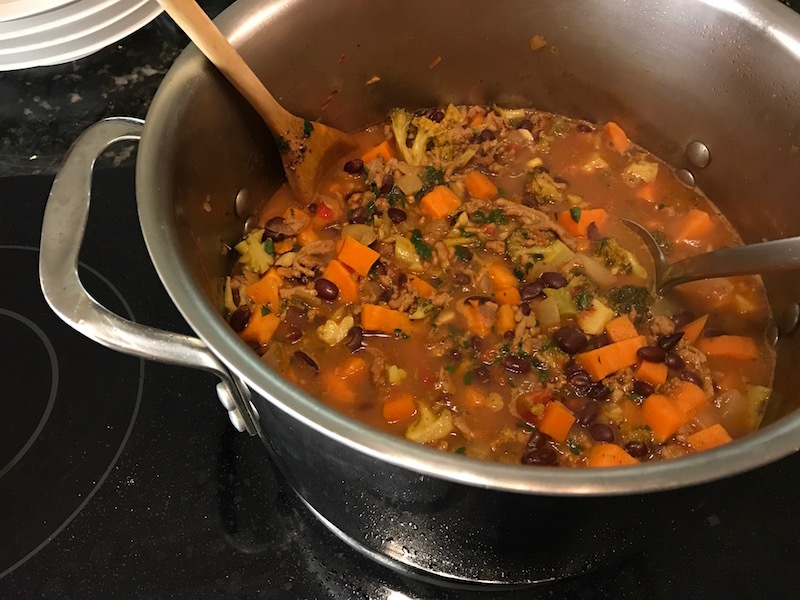 This version of the recipe has 250 calories for a two-cup portion, with 8 grams of fat, 17 grams of protein, and 30 grams of carbs. And it’s filling! 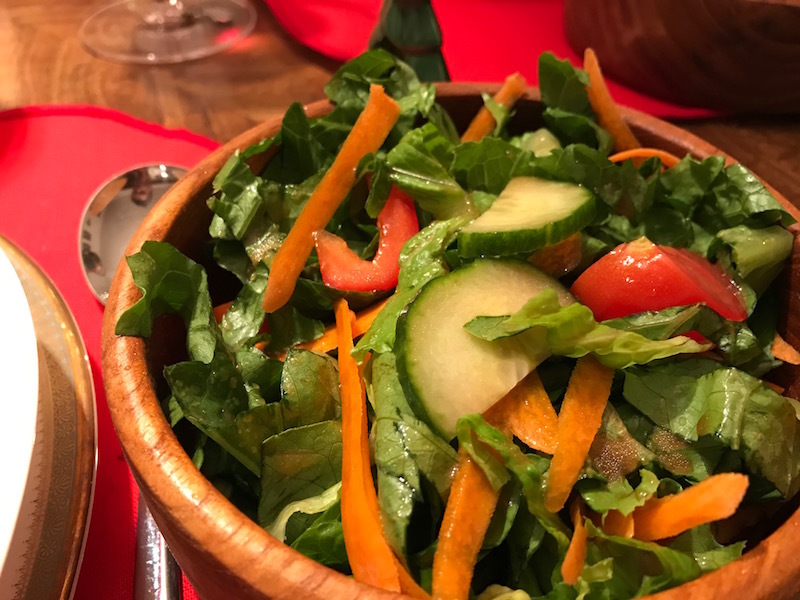 The only other thing I made for this meal was a simple side salad. I could eat like this every day. And who knows? Maybe I will! 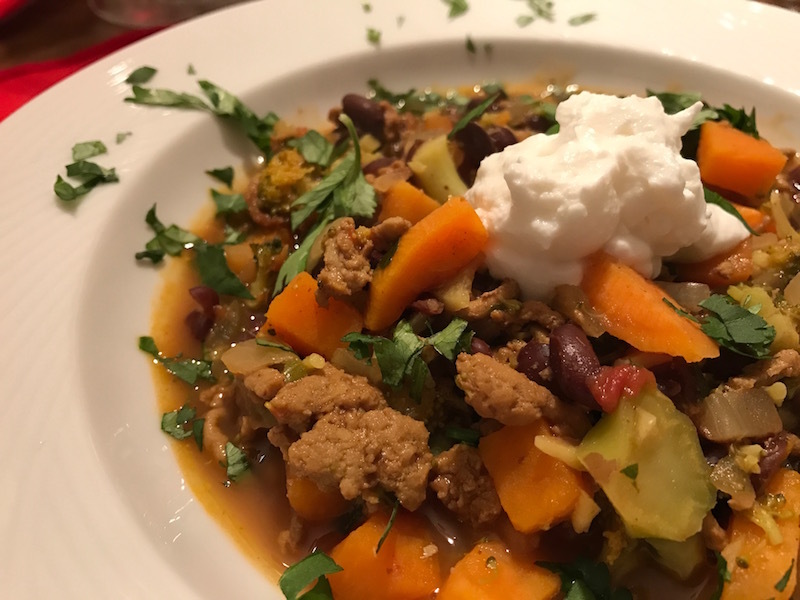 There’s oodles and oodles of healthy recipes archived on my Recipes page so drop everything and check it out! This entry was posted on Thursday, January 12th, 2017 at 11:00 am and is filed under Uncategorized. You can follow any responses to this entry through the RSS 2.0 feed. You can leave a response, or trackback from your own site.